What's the star attraction in your town? What's the place where the widest range of residents, from kids to seniors, visit and spend their time? Where do people go to hear interesting speakers and discuss new ideas? And, by the way, where can they go to take home a book, CD, or DVD at virtually no cost? The new Hudson Public Library centers the Main Street Extension development, which includes retail and housing. A large central square/park is under construction in the foreground. 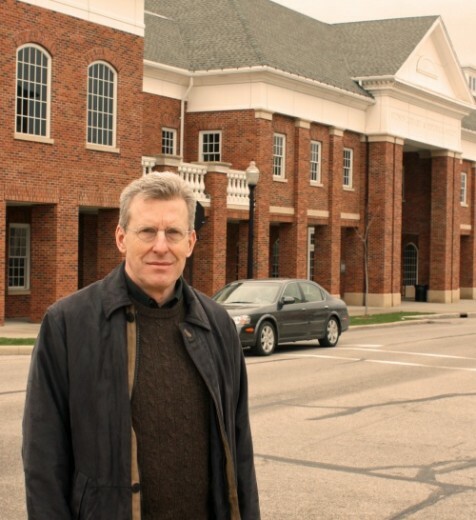 Mark Richardson in front of the new library. I met with Community Development Director Mark Richardson, a North Dakota transplant, and Margie Smith, Assistant Director of the Hudson Library & Historical Society. 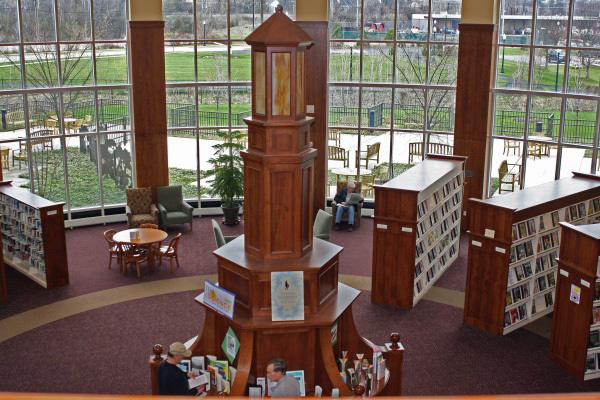 And, yes, the star attraction in Hudson, Ohio, is its library. Hudson is a small Ohio city (population 22,439), midway between Cleveland and Akron. It has elements of both a suburb and a small town. 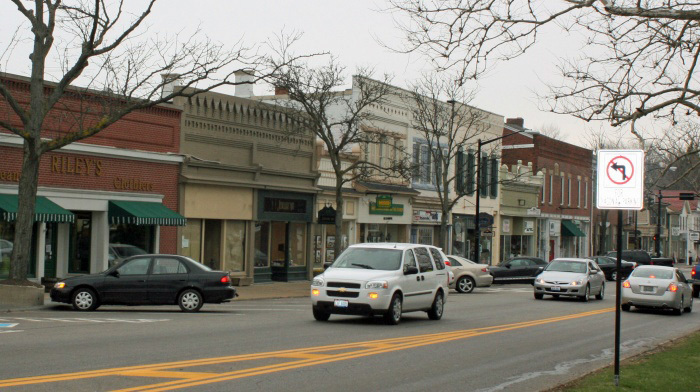 One key part of Hudson is its historic Main Street business district. More on that in a minute, as it's related to the library. But first take a look at the library itself. It's a stately brick building, with functional but very attractively designed interior spaces. 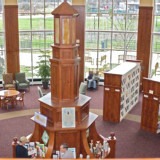 The heart of the library is its rotunda (see photo below), showing that the design of libraries today -- even in smaller cities -- can match that of the classic Carnegie library buildings of a century ago. The new library is at the heart of Hudson, and the rotunda is at the heart of the library. As I've been learning, however, new libraries tend to need considerably more space than their earlier counterparts. That's the case in Hudson, where the new library building (at 50,000 square feet) is much bigger than the old building (at 17,000 square feet). At first blush this seems counter-intuitive. Why in today's internet and digital age would libraries need to be larger? More importantly, why do they seem in even greater demand? What I've been finding so far (see also my report about the Putney, Vermont, library) is that in today's digital age there's even more demand for public libraries. The role of the library has also been evolving, taking on a broader range of community-related functions. What's draws people to the Hudson library? I asked Smith. "It's become the cultural, entertainment, and social hub of Hudson," she replied. "The library programs a lot of readings, there are musical performances every week, and we also have meeting rooms." Add in over 50 public computer terminals, access to state and local databases, and a collection of more than 7,000 DVDs. Plus a coffee shop to hang out in, and an outdoor patio. You can even borrow laptops from the library, and use them anywhere in the building or on the patio. The library also benefits from the fact that it's home to the Hudson Historical Society, which has its own space on the second floor, and to the Burton D. Morgan Center for Entrepreneurship Research. While the library has a large children's reading room, Smith told me that perhaps the smartest move the library made was to also include a separate room for teens. The Hudson library doesn't close till 9 pm, Monday through Thursday, and is open a total of 69 hours each week. The library is funded primarily through a property tax levy (raising $1.4 million), with just over $1 million more from the State of Ohio (income tax revenues). The library also makes extensive use of volunteers, including "techwizards" who help out in the computer center. The residents of Hudson have decided that the library is a key service they want for their community. The numbers attest to this, as there are more than 23,000 registered library users, who checked out 736,000 items last year. The library counted more than 700,000 visits, an average of well over 2,000 every day it was open. For planners, however, I want to touch on what may be the most interesting aspect of the Hudson library: its location. It is part of an expansion of Hudson's Main Street district. Indeed, you could say it's the star attraction. As Community Development Director Mark Richardson told me, "you can't just rely on retail in downtown expansion, you need an activity center like a library." (apologies for the quality of the video clip I shot, as you can tell I'm not a skilled cinematographer! but it's still worth a look). 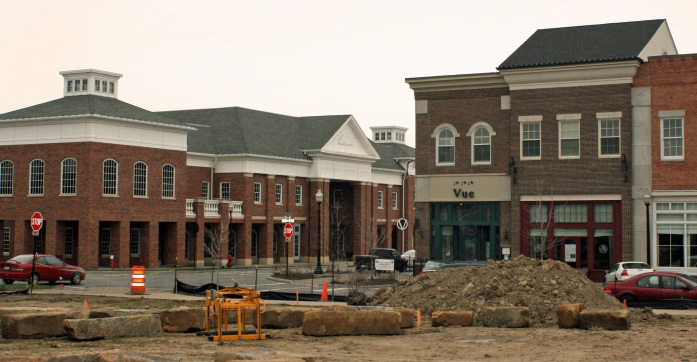 The Main Street extension (called First & Main) consists of a mix of retail, office, and housing. It's located right next to the existing Main Street district. Above: Hudson's Main Street. Below: the new Main Street Extension project, which includes the library, is just off Main Street and is designed to complement the older Main Street buildings. In addition to the library, the Main Street Extension project includes retail, housing, and a large central square providing green space. 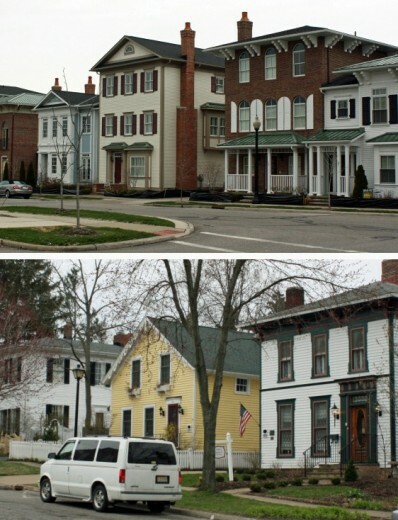 The new housing that is part of Main Street Extension (upper photo) is designed to be compatible with older housing nearby (lower photo). The City has architectural design standards for the area. 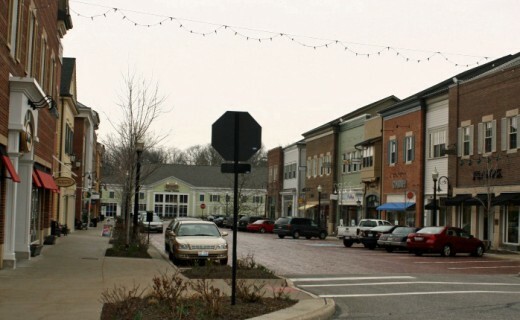 As Richardson explained, "the idea was for it to be a natural extension, not a replication, of Main Street." The streets are laid out in a grid, connecting with the old village. While there's a modest parking garage, there's also surface parking. As Richardson noted, "there's an expectation here for that being available." Richardson also foresees a future phase of the project including substantially more housing, as "there's strong interest from empty-nesters." Hudson is ready to grow -- and the library will remain at its heart.